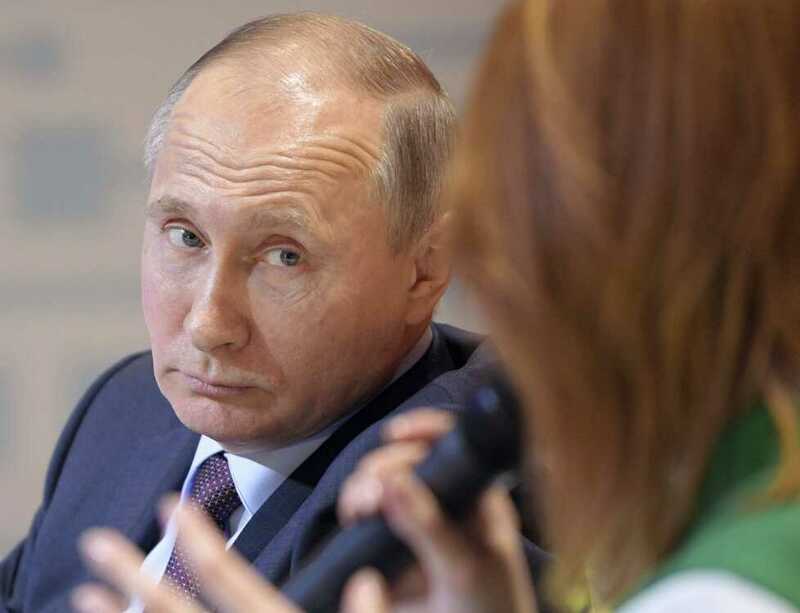 Russian President Vladimir Putin seen during his participation Tuesday in the sixth All-Russian Forum of Working Youth in Nizhny Tagil, Sverdlovsk region, Russia. Putin traveled to the town of Nizhny Tagil in the Urals to visit Uralvagonzavod, a huge factory producing battle tanks for the Russian military and railroad cars. NIZHNY TAGIL, Russia -- Russian President Vladimir Putin on Tuesday took his campaign to one of Russia's leading industrial companies, vowing to bolster high-tech industries and improve living standards. Putin traveled to the town of Nizhny Tagil in the Urals to visit Uralvagonzavod, a huge factory producing battle tanks for the Russian military and railroad cars. The trip comes as the Russian leader seeks to shore up his support base before the March 18 presidential election. The Uralvagonzavod plant was emblematic of Putin's 2012 campaign, when he relied heavily on support from blue-collar workers amid large rallies against his rule in Moscow. Back then, Putin cast the mostly urban middle class protesters as Western stooges, part of a spoiled elite at odds with the country's majority. In a fiery speech underlining the highly divisive 2012 campaign, a foreman at the Uralvagonzavod offered to Putin during the president's live TV call-in show to lead its workers to Moscow to stand up to Kremlin critics to help defend the nation's stability. No such polarization is visible now. With Putin's ratings topping 80 percent, he is running a calm campaign, posing as a confident father-of-the nation. He seeks to cater to different groups of voters, promising an economic recovery, higher wages and pensions, better health care and education and more modern infrastructure. "We need to raise living standards and bring down the number of people who live below the poverty line," Putin told workers at the plant Tuesday. The Russian economy last year barely started climbing out of a two-year recession caused by the combined blow of a drop in global oil prices and Western sanctions triggered by the Ukrainian crisis. The Uralvagonzavod plant also has been hit by the crisis and recently found itself on the verge of bankruptcy. While the demand for its tanks has remained strong amid Russia's military modernization, orders for railway cars have slumped. Some workers at Uralvagonzavod have been angry over a drop in wages and a few even sued the management. No such discontent was visible, however, during Putin's visit to the sprawling plant Tuesday when he hailed the plant as "legendary" and was repeatedly greeted by the workers' applause. Workers asked questions related to the future of heavy industries and professional training, and Putin promised to offer broad opportunities for professional training and learning new skills.